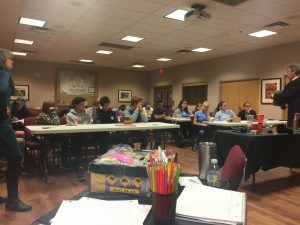 Science, magic and some amusing mathematics were at the heart of this Café Scientifique NM presentation given by Liz Martineau and Gordon McDonough by our Taos member. They demonstrated the connection between science, magic and some amusing math. They took the illusion out of the magic by explaining the science and math that allow magicians to perform. The same scientific method is used in magic shows, but a good magician never repeats a trick twice in order to not allow the audience the opportunity of creating a hypothesis about the performance. Magicians therefore rely on communication with the audience, in order to misdirect or direct the attention of the audiences. Another trick Liz and Gordon performed was the black hole trick. They had a black box with a hole drilled into it. The hole seemed to be a darker black than the black of the box. But, when they opened the box, the inside was completely white. Science also explained this trick. The reason why the hole was darker than the box was because the only light going into the box came from the hole. Because the hole was so small, the light reflected back onto each side so many times that there is almost no light left to come out of the hole. Liz and Gordon’s magic tricks were all based on science and had scientific explanations for how they worked. The next part of the presenters presentation was about scientific effects and not so much about magic tricks. 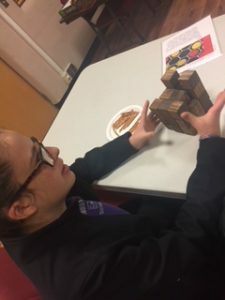 The presenters brought more than two dozen puzzles that challenged the teens to figure out the science, magic and some amusing mathematics, behind behaviors that looked random or objects that required excellent spatial visualization skills to solve. Individually and in groups, the teens were engrossed in solving puzzles and sharing their insights with one another for the rest of the café. 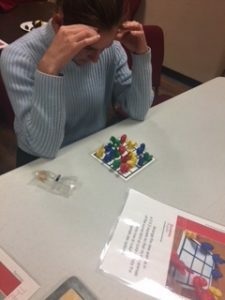 The underlying theme of the cafe reinforced how careful observations and calling on math, spatial skills and some physics can generally solve or explain what seems to be magic.